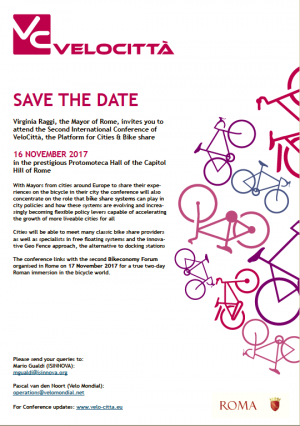 Virginia Raggi, the Mayor of Rome, invites you to attend the Second International Conference of VeloCittà, the Platform for Cities & Bike share 16 NOVEMBER 2017 in the prestigious Protomoteca Hall of the Capitol Hill of Rome. With Mayors from cities around Europe to share their experiences on the bicycle in their city the conference will also concentrate on the role that bike share systems can play in city policies and how these systems are evolving and increasingly becoming flexible policy levers capable of accelerating the growth of more liveable cities for all Cities will be able to meet many classic bike share providers as well as specialists in free floating systems and the innovative Geo Fence Plan for cities, the alternative to docking stations. The conference links with the second Bikeconomy Forum organised in Rome on 17 November 2017 for a true two-day Roman immersion in the bicycle world.